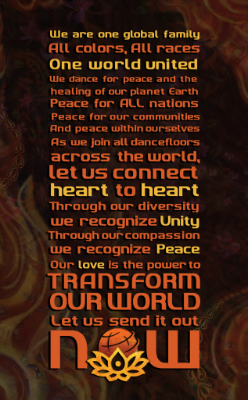 Earthdance Florida is part of a global party for peace. Would you go to a festival where the theme was ancient mythology and you'd have the chance to recite a Prayer for Peace with people all around the world at the exact same moment? 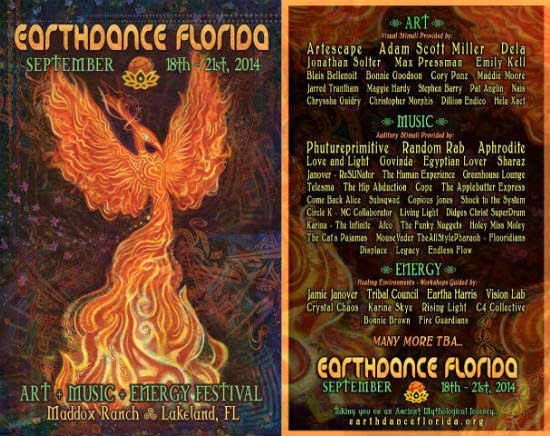 Attendees at Earthdance Florida 2014 will get to do just that, over the weekend of September 18-21 at Maddox Ranch in Lakeland, Fla. This 4-day festival, presented by Earthdance Florida — a branch of Earthdance Global — is part of the largest global peace party that has been held in over 600 locations in 80 countries since 1997. Florida's event will feature art, music, workshops, live performances, and vendors spread over five interactive "realms", inspired by ancient cultures and the elements. The Greek Realm (Air) will host Saturday's Prayer for Peace at 7 p.m., with an effigy performance and burn to follow at 8:30 p.m. It will also be home to the Lotus Tempe Stage and the vendor market. The Egyptian Realm (Fire) will hold the Gateway to Eternity Stage and be the location of various flow workshops throughout the weekend. Vision Lab's visionary art galleries will be found in The Asian Realm (Spirit), as well as the Tribal Council dome where art, energy, and wellness talks and workshops will take place. Local change organizations Rising Light and C4 Collective will host workshops on sustainability, upcycling, and more in The Celtic Realm (Earth), the site of the food market and recycling and compost station. Finally, The Atlantis Realm (Water) will be a place to get wet in the pool or showers, open 8 a.m. to 8 p.m.
Musical acts to include Random Rab, Phutureprimitive, Aphrodite, Govinda, The Human Experience, and Greenhouse Lounge, as well as local favorites Come Back Alice, The Funky Nuggets, and Holey Miss Moley will be performing over the weekend. Dela, Christopher Morphis, Emily Kell, and Bonnie Goodson are just a few of the visual artists that will be present at the festival. Other activities and art installations have yet to be announced, and tickets are still just $80 until August 1. A portion of profits will go to The Salvation Army George W. Jenkins Community of Hope — a holistic support system for homeless families and children in Lakeland and Polk County — and to Earthdance's nonprofit. A "hybrid community" that welcomes people of all types, Earthdance Florida is produced by Matt and Belinda of Controlled Chaos Productions, based in Sarasota, Fla. According to Belinda, "Everyone is a part of our story. From the performers, to our staff, vendors and participants, we are all a part of our creative transformation. Like a cosmic web, together we are spreading our love in infinite directions through our natural creative forces." Earthdance Global was envisioned by London-based musician and event producer Chris Deckker, as he stood in the King's Chamber of the Great Pyramid of Giza in 1996. At its first iteration in October of 1997, Earthdance was held in 22 location in 18 countries. Now aligned with the UN International Day of Peace on September 21, last year's event was celebrated in over 60 locations in 25 countries. Each location selects a local charity to donate 50 percent of its profits to. Events range from music festivals and concerts, to club nights, to house parties, to simple public gatherings. This year's Earthdance Global theme is transformation and the hub event will be held in Cape Town, South Africa. What do you think is the best part about Earthdance Florida 2014? Share in the comments below and subscribe or like Live Music Is Evolving on Facebook to learn more about events with purpose in the Orlando area. Thandiwe Ogbonna is a freelance writer based in Orlando, Florida. Constantly inspired by the love, acceptance, and incredible stories she encounters on her journeys to and from live music events across the East Coast and Midwest, she documents her experiences so others can share in her joy. She writes for The Untz, and has written for DubEra.com, NoDepression.com, and Home Grown Music Network. Tweet to her, @ThandiWay, and tell her about your next great event.